Want tosave 9,95 kn on this order and become Loyalty program member? 180 kapsula = 6 kapsula = dovoljno za 30 dana korištenja! High-quality dietary supplement with biologically active, highly unsaturated fatty acids. Borage oil is characterized by an extremely high content of gamma linolenic acid. 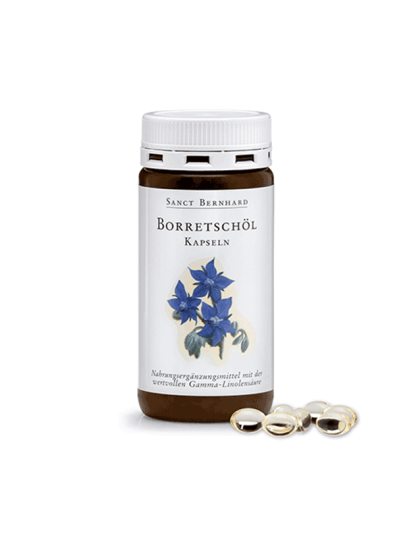 Among other things, it triggers metabolism, supports natural hormonal balance and skin metabolism, and in particular helps in dry, wrinkled and flaky skin.Each capsule contains 500 mg of purple borage oil with about 22% linoleic acid (110 mg per capsule)! Keep in dry and dark at temperatures up to 25 ° C.
Marked on the back of product. Drink 2 capsules 3 times a day (2 x 3) with plenty of liquid, along with food.